Excellent social workers are always striving to gain new knowledge. The Master of Social Work (MSW) is the right programme for you if you already have a professional qualification in social work and want to improve your practice. The MSW programme is intended for practitioners who wish to undertake advanced study of a specific aspect of social and community work. The MSW is flexible and offers you opportunities for both full and part-time study. The MSW is a thesis-based programme that encourages social workers to pursue research in a particular field of practice, population, or area of interest. It equips social workers to develop and use research skills in their practice settings and keep current with the very latest theories and practice. Practice-based social work research can include needs assessments, programme development, implementation assessment and programme evaluation. It also includes theory development in a New Zealand context. I’ve always wanted to be a social worker, ever since I was 15 years old. I never thought I could achieve this. My parents were not advocates for education when I was growing up, so I dropped out of school at an early age. However, I had a passion and fire for social justice that became stronger in my adult years, so I was always going to choose social work as my profession. For my undergraduate degree, I was a full-time student. My experience was a very positive one surrounded by like-minded people who supported me through my studies as a mature student and as a Māori student. I was employed straight away in the area of Māori mental health and stayed there for six years. When I moved on to my Master’s degree, I was part-time studying and full-time employed. I relied on the support at Massey, as well as my work colleagues. It took a lot of discipline and hard work to complete, but my experience, although overwhelming at times, was very positive in terms of my academic growth. My Master’s degree enhanced my ability to place my voice out into the academic world. Both degrees enabled me to explore topics I was interested in, encouraged me to think about things in different contexts and challenged my own worldviews and values. The best part about studying at Massey was access to Māori resources, Māori lecturers and Māori spaces all catered to by Massey. This determined the way I learned as Māori, being comfortable in a western dominated institute. Coming back to Massey in a teaching capacity is my way of giving back to the Bachelor of Social Work programme, but also gives me a pathway to my PhD, where I can take my passion to the next level. I have been privileged to have an excellent team around me supporting my development and progress. In terms of career, it is really all about what pathway you want to choose and what interests you. Social work is very diverse and can take you in many directions. The exciting thing is deciding which way to go. Professionally trained people working in the social services make a vital contribution to present day New Zealand society, and their skills are in increasing demand. 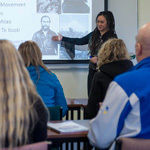 The Master of Social Work will enable you to practice at senior levels in New Zealand and many other countries in a wide range of social service fields. These include government services, such as Child, Youth and Family and Community Probation, Hospitals, and Iwi, hapu, and Pacific Island organisations. Graduates with the MSW can expect to take up leadership roles in all these settings, and they may achieve senior positions in a variety of career paths. These can include any of the roles in the list below.